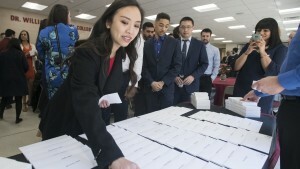 Shirley Chen finds the envelope that contains her residency match information. All smiles as Shirley Chen learns she matched at MedStar Washington Hospital Center in Washington, D.C.
Shirley Chen poses with her letter from MedStar Washington Hospital Center in Washington, D.C. 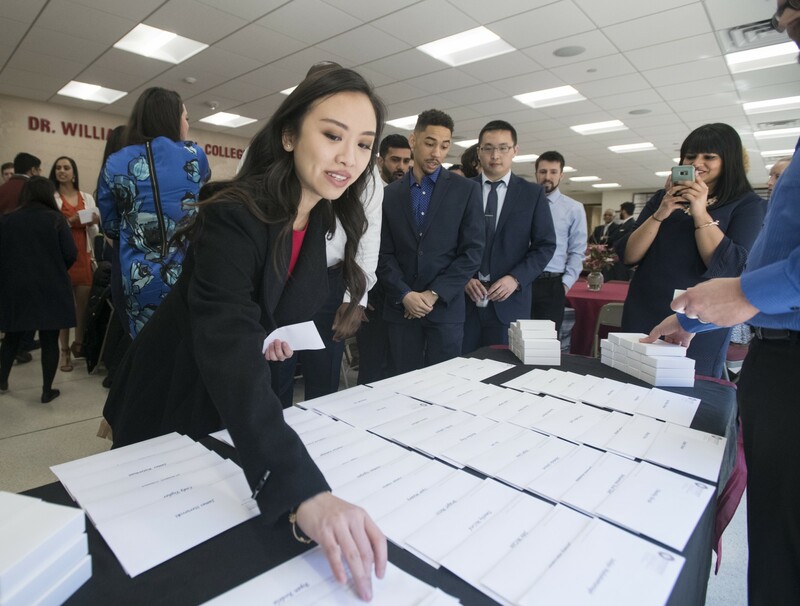 The Dr. William M. Scholl College of Podiatric Medicine (SCPM) celebrated a 100 percent residency placement during its Match Day event on March 23. Fourth-year Scholl College students (P4s), joined by friends, family and SCPM faculty and staff, gathered in the Scholl Gallery to learn where they will complete their residency training for careers in podiatric medicine and surgery. 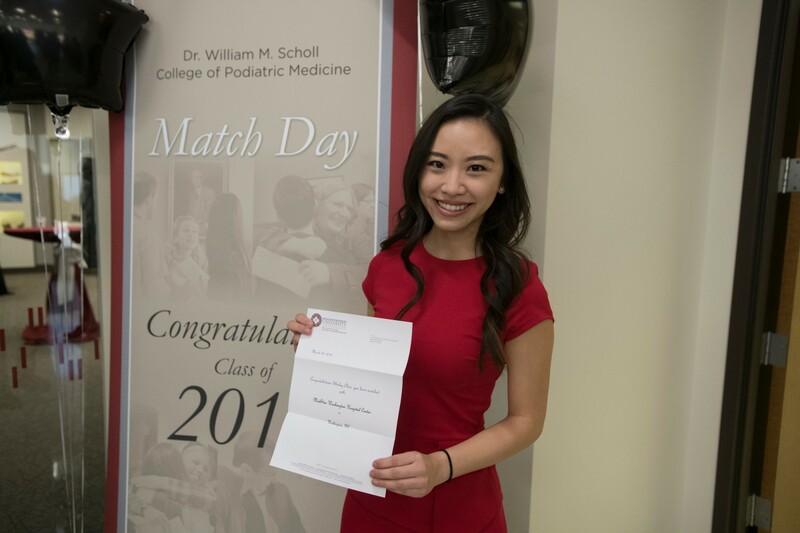 Shirley Chen, SCPM ’18, matched to her first choice, MedStar Washington Hospital Center in Washington, D.C., where podiatric residents earn an additional credential in reconstructive rearfoot/ankle surgery. P4s in the nation’s nine podiatric medical schools participate in the Central Application Service for Podiatric Residencies (CASPR). Previously graduated students who have not yet completed a residency also participate in the process. According to Initial estimates, 30 students will go unmatched in 2018. “That makes a 100 percent placement rate even more impressive,” Dr. Parsley said. 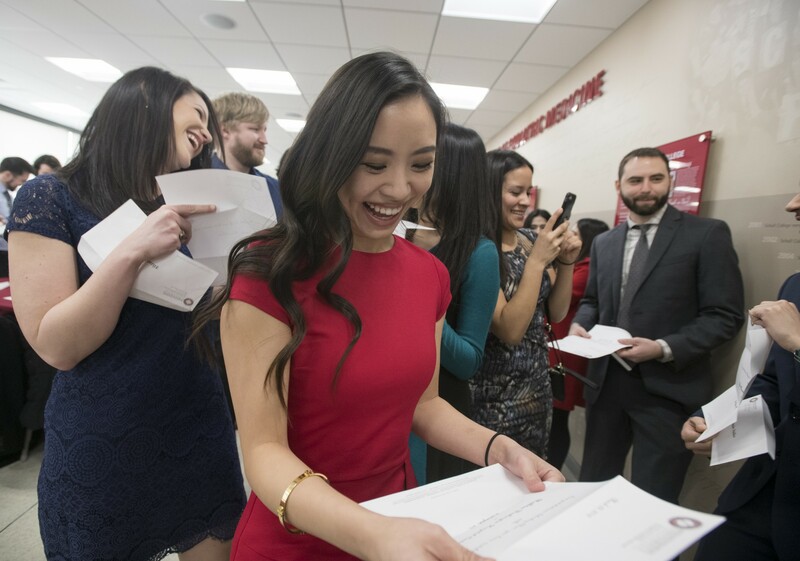 Scholl students matched into residences at high quality hospitals and medical centers around the country, including Illinois, Wisconsin, California, New York, Vermont, Colorado, Arizona and Texas. 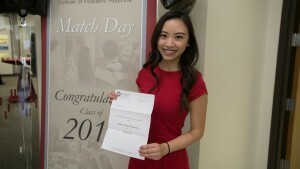 Shirley’s prospects were bolstered by a curriculum vitae that includes collaboration on two peer-reviewed papers and authorship of a manuscript accepted for publication by the American College of Foot and Ankle Surgeons (ACFAS). The latter paper was a product of her NIH-funded Summer Research Fellowship through Scholl College’s Center for Lower Extremity Ambulatory Research (CLEAR), where she worked under the mentorship of Associate Professor Adam Fleischer, DPM ’01, MPH. Twelve SCPM P1s earn the fellowship each year. Diverse clinical experiences offered to Scholl students also help strengthen chances for a residency match. Shirley is completing her final rotation in general surgery at Chicago’s John H. Stroger, Jr. Hospital of Cook County.